This considerable Superior Shed in Cheltenham was purchased by our model train enthusiast in Gloucestershire. With a large and increasing collection of trains and layouts, he was looking for somewhere to set up the collection but also provide a separate storage space, which he achieved through the addition of an internal partition. 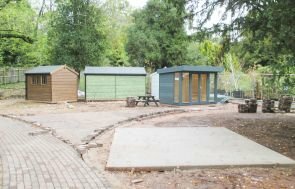 With frequent use and tables for the track to stand upon, he added a heavy duty floor, double the standard thickness, together with floor, roof and wall insulation and an electrical pack to provide a space that can comfortably be used all year round, whatever the time of day. Most garden buildings, even significant size ones, do not usually require planning permission (although there exceptions if you live in areas of outstanding beauty or listed properties). Find out more about Planning Regulations in our related article. I had to put pen to paper or rather finger to keyboard and email you. After 12 weeks wait and a big bill, My shed arrived Tuesday 10th September. What can I say, this is not a shed it is a vastly superior model railway building. Well worth the expense and wait. Roger and Steve arrived on time and although having to navigate down the overcrowded cul-d-sac to My house, were both cheerful and efficient. The shed is more than expected even after visiting Narford to view the sheds. From the first phone call, through dealing and ordering with James to the final payment over the phone everyone at Cranes has been both friendly and professional. Although there was a small problem it has now been sorted in your usual friendly manner. Once again thank you all for your wonderful service and a shed to make the neighbours jealous and modelling an even bigger pleasure. We hand build every garden building in Narford, Norfolk at our factory HQ using FSC® certified timber from Northern Sweden, sourced for its slow growing, dense properties. We have a number of show centre locations around the UK, with around 25 buildings on display at each - why not visit our onsite team and experience the build quality for yourself at Narford, Norfolk, Edwalton, Nottinghamshire, Burford, Oxfordshire, Newbury in Berkshire, Sunningdale, Surrey and Brighton in East Sussex. 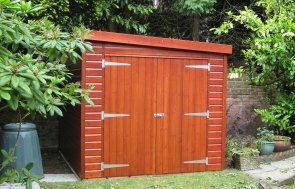 If you would prefer to discuss your garden shed needs with one of our friendly team directly, please Request a Callbackor call us on 01760 444229 and we will be more than happy to talk through any requirements you may have.